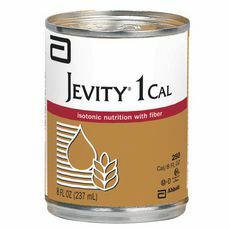 You are buying Abbott Jevity 1 Cal High Protein With Fiber Institutional 1000ml Each, model #62685. ADW Diabetes offers a complete line of enteral feeding supplements for both children and adults. Complete, Balanced Nutrition for long-term tube feeding. 14.4 g of total dietary fiber/L. Fiber helps maintain normal bowel function and may be useful in the dietary management of diarrhea and constipation. Meets or exceeds 100% of the RDI for 24 essential vitamins and minerals in 1400 Cal (1321 mL). Provides protein to help support lean body mass and wound healing. Water, Corn Maltodextrin, Corn Syrup Solids, Sodium & Calcium Caseinates, Soy Fiber, Soy Protein Isolate, Canola Oil, Corn Oil, Medium-Chain Triglycerides, Calcium Phosphate, Potassium Citrate, Magnesium Chloride, Soy Lecithin, Sodium Citrate, Ascorbic Acid, Choline Chloride, Magnesium Phosphate, Potassium Chloride, Carrageenan, Taurine, L-Carnitine, Zinc Sulfate, dl-Alpha-Tocopheryl Acetate, Ferrous Sulfate, Niacinamide, Calcium Pantothenate, Manganese Sulfate, Cupric Sulfate, Thiamine Chloride Hydrochloride, Pyridoxine Hydrochloride, Riboflavin, Vitamin A Palmitate, Folic Acid, Biotin, Chromium Chloride, Sodium Molybdate, Potassium Iodide, Sodium Selenate, Phylloquinone, Cyanocobalamin, and Vitamin D3.